LAHORE (PR) - Rotary Club of Lahore Garrison provided teaching aids and library books to two primary schools for boys and girls in Chak 73/RB Karianwala in district Faisalabad through The Rotary Foundation Matching Grants. The club president Akram Shaikh stated this in a press release the other day. Rotary Club of Glenville and Rotary International District 7190, NY, USA, are the sponsors for the two grants. LAHORE (PR) - Rotary Club of Lahore Garrison, in association with Rotary Club of Glenville, New York, has arranged Rotary volunteers from Brazil, India and USA to visit Pakistan and provide training to schoolteachers in Lahore and Sheikhupura. In a press statement Rotarian Shehzad Ahmed said that Eliane Marin from Brazil was a Group Study Exchange team member who went to Rotary International District 7190, New York on a goodwill exchange trip and met Rotarians from Glenville who motivated her to visit Pakistan to train teachers at Rotary adopted schools. Rotarian Madhumita Bishnu from India has already served as a Rotary Volunteer in Dhaka and Kenya in the past and is a technical advisor under Humanitarian Grants cadre for Literacy and Environment. Rotarian Steve Williams will assist in setting up computer labs and clinics. All Rotary volunteers will be provided home hospitality by local Rotarians who will also act as their facilitators in providing the boarding, lodging, and transportation and sightseeing facilities. LAHORE (PR) - Rotary Club of Lahore Garrison, in association with its sister club, Rotary Club of Glenville, New York, has arranged Rotary Volunteers from Brazil, India and USA to visit Pakistan and train school teachers. In a press statement issued on Tuesday, Rotarian Shehzad Ahmed said consistent follow-up from all stakeholders resulted in bringing this programme to reality. The local Rotarians will act as facilitators to the Rotary volunteers in providing the boarding, lodging, and transportation and sightseeing facilities to make their stay comfortable and worth remembering. LAHORE (PR) - The Rotary Club of Lahore Garrison provided latest Pentium IV computers, laser printer and scanner to Paradise computer lab, Thokar Niaz Beg. According to a press release issued here Saturday, the Club president Rotarian Saeed Chaudhry said that the club was planning to arrange a container load of refurbished computers from USA to distribute among various schools in Punjab. In addition to the above grant, Rotary Club of Lahore Garrison has recently completed a grant to provide basic necessities to two government schools in Kujer village, Sheikhupura and has also set up a computer lab in the same village. The Rotary Foundation has provided around 150 Matching Grants with funding more than US$ 2 million to benefit the poor residents of Pakistan. Rotary Club of the Lahore Garrison provided latest computers, a laser printer and a scanner to the Paradise computer lab in The Trust School, Thokar Niaz Beg, through The Rotary Foundation Matching Grant programme. This was stated by the club president, Saeed Chaudhry, in a press release. Rotary International District 7190, NY, the US, was the sponsor for the grant. Rotarian Shehzad Ahmed said that the club was planning to arrange a container of refurbished computers from the US for distribution among various schools in Punjab, for which it was working with its sister club, Rotary Club of Glenville. In addition, the Rotary Club has completed a grant to provide basic necessities to two government schools in Kujer village, Sheikhupura, and has also set-up a computer lab in the village. 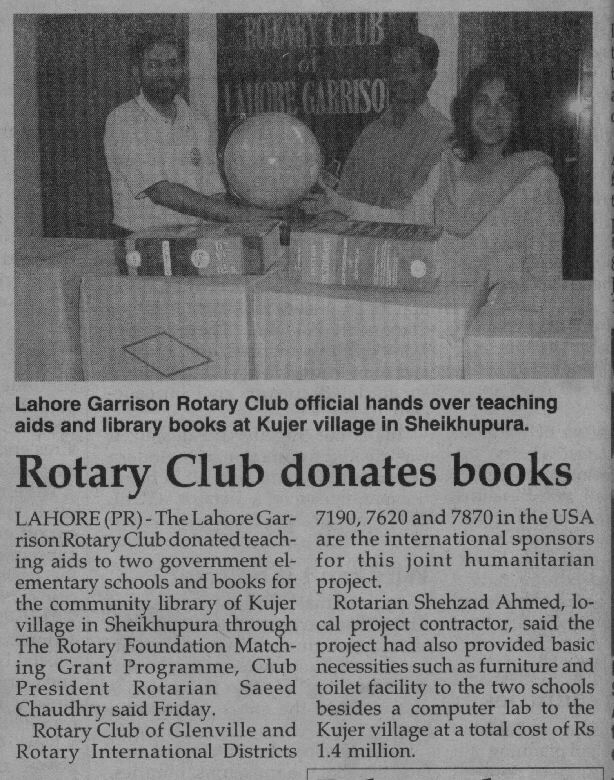 The Lahore Garrison Rotary Club donated teaching aids to two government elementary schools and books for the community library for Kujer village in Sheikhupura through The Rotary Foundation Matching Grant Programme, Club President Rotarian Saeed Chaudhry said Friday. Rotary Club of Glenville and Rotary International Districts 7190, 7620 and 7870 in the USA are the international sponsors for this joint humanitarian project. Rotarian Shehzad Ahmed, local project contact, said the project has also provided basic necessities, such as furniture and toilet facility to the two schools besides a computer lab to the Kujer village at a total cost of Rs. 1.4 million. LAHORE (PR) - President and members of Rotary Club of Lahore Garrison visited The Trust School to discuss donation of latest computers for upgrading the school's existing computer lab. The Club will provide Pentium 4 computers to the school as a part of The Rotary Foundation Matching Grant project, with Rotary District 7190, NY, USA as the International sponsor. Rotarian Shehzad Ahmed, primary project contact, informed that in addition to this grant, the club was already working with its sister club, Rotary Club of Glenville USA, to bring a container load of refurbished computers from USA for distribution among various schools in Punjab. Rotary International is the largest and the oldest service organization with more than 1.22 million members worldwide with presence in 168 countries. The Rotary Foundation had provided around 150 Matching Grants with funding more than US$ 2 million to benefit the poor residents of Pakistan. Rotary Club of Lahore Garrison is the leading club in Pakistan with maximum number of completed Matching Grants to its credit. It is currently working on Matching Grants in Punjab for providing basic necessities to schools in rural Sheikhupura and rural Faisalabad. Another grant for providing reproductive health awareness had been approved. The club had also sponsored water grants in interior Sindh for providing safe drinking water to the poor communities.